Superbe villa à 3 étages avec magnifique vue depuis toutes les pièces à Kisla. Villa nouvellement gérée : 2 chambres doubles et 2 chambres à lits jumeaux avec salle d’eau attenante et un salon/salle à manger/cuisine ouvert au rez-de-chaussée. Sur le toit : merveilleuse terrasse avec vue panoramique sur la baie. On peut se restaurer sur la terrasse de la piscine avec sa table en marbre et ses 8 chaises. À seulement 3 minutes à pied du beach club le plus proche et de la mer et à quelques minutes d’excellents restaurants. Kalkan : 25 minutes à pied ou 5 minutes en taxi. Les nouveaux propriétaires améliorent la villa qui sera prête pour la saison en avril 2014. Ils connaissent bien l’histoire et la culture locales et le nouvel intérieur le reflétera. Les photos existantes ne montrent pas les formidables améliorations. De nouvelles seront publiées dès que possible. Avec ses 4 chambres, cette villa est idéale pour de jeunes familles en particulier si elles veulent partager des moments. Chaque chambre dispose d’une salle d’eau attenante avec toilettes, cabine de douche et lavabo. Cuisine Lineadecor avec appareils intégrés Franke : cuisinière mixte, micro-ondes, plaque de cuisson 4 feux avec hotte, lave-vaisselle, grand réfrigérateur/congélateur, bouilloire, grille-pain, robot, appareils électrique, couverts et vaisselle complète. Avec ses 2 chambres doubles et ses 2 chambres à lits jumeaux avec salle d’eau attenante sur 2 étages, l’agencement est idéal pour une jeune famille, en particulier si elle veut partager des moments avec des amis ou d’autres parents. Si seule une famille de 4 personnes ou moins s’intéresse à la villa, nous pouvons faire une réduction mais l’étage supérieur sera fermé et indisponible. De même, Villa Kaplumbaga est idéale pour un couple souhaitant passer des vacances ensemble. Les tarifs en hiver supposent que la piscine sera vide et non entretenue. Si vous souhaitez avoir la piscine en dehors de la haute saison, des frais supplémentaires seront facturés. Les nouveaux propriétaires améliorent la villa : nouvelles fenêtres en PVC pour une meilleure vue et plus de lumière, redécoration complète de l’intérieur, suspension de kilims locaux et plus de couleurs dès que possible. Un agent immobilier Anglais réside à Kalkan et est disponible pour vous aider durant vos vacances. Super villa in Fabulous location with amazing views. Wow! What an amazing villa! Cannot fault it! Very spacious inside, modern and well equipped.... even down to sun hats available to borrow and books to read. The views from every part of this villa are outstanding and never failed to take my breath away. Outside is also very spacious with different seating areas and good sized pool cleaned daily by Irfan.... who also Delivers a loaf of fresh bread every day. We would describe the interior and exterior of the villa as luxurious. 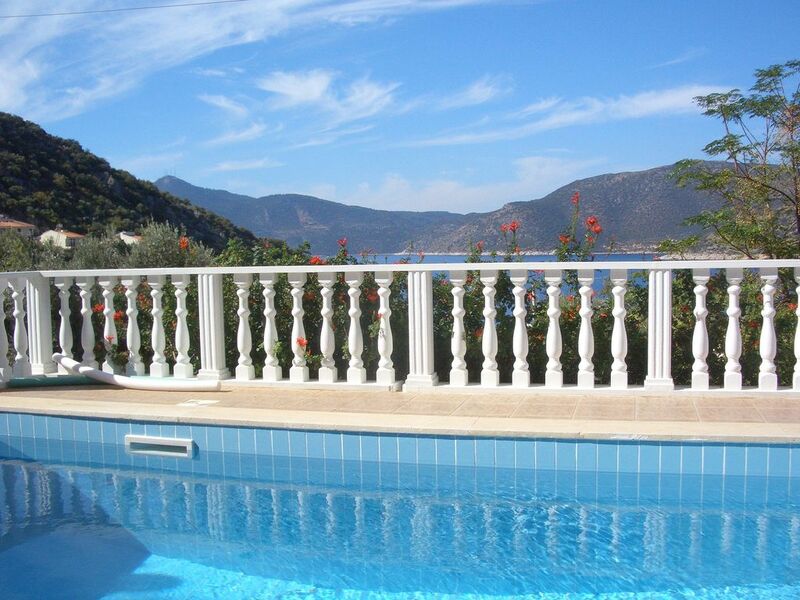 This is our second time to Kalkan and we would not hesitate to return to this gorgeous villa. The Kalkan beach club is a 2 minute walk down the road with great drinks, food and various fun activities such as water slide and canoes which are all free. Several other restaurants are within a few minutes walk of the villa as is Bobs supermarket which is pricey but convenient. Karyn manages the villa and is on hand to answer any questions and sort out any excursions. Delighted to hear that you enjoyed Villa K so much and had such a great holiday. Thank you for taking the time to write a review and for sharing your thoughts. We look forward to welcoming you back ! Amazing property in a fantastic place. This is a great place to stay. 3 minutes walk from Kalkan beach Club. Our 3 teenage boys could have their independence within a reasonable distance from us! The villa is well equipped with everything you need. The gardens and pool are cleaned daily by Irfan who will deliver bread every morning if asked. Karyn Rutherford who runs the villa is an absolute gem. This was our first time to Turkey and she made everything possible, no job too little or too big. Kalkan is a 15 minute sea taxi ride away or 10 minutes in ordinary taxi. Do not hesitate to book this property, definitely value for money!! The boys each had their own room with en-suite and a balcony. Delighted that your enjoyed your stay at Villa Kaplumbaga so much, hope to see you back again very soon ! As always, what a wonderful stay in Kalkan. A place close to my heart. This is my 4th time staying in Villa K and every time it feels like it gets better and better. The villa is kitted out with everything we needed to make our stay a comfortable one without loosing a warm homely feeling. The rooftop views at sunset are one of my all time favourite places to. A truly magical and reflective location. The owner of the property goes out of their way to think of what the villa needs - and then some! Everything is well - maintened and cared for. Going to Kalkan Beach club for an afternoon dip is a must - along with a iced coffee! If you go for an early morning swim, you may be in luck to see a turtle or 2! Taking out a day boat with Deniz is also an unmissable experience, we spent the whole day swimming with turtles in quiet, secluded bays! I have no doubt that I’ll be back! The villa is very clean, modern and extremely well equipped and a home from home. A great amount of space inside and out so that everyone was able to chill. The location in Kisla is quiet but with easy access to the beach and Kalkan town by car or water taxi. Support from the owner and her representative was excellent and made the stay so easy. Delighted that everything at Villa Kaplumbaga was of a high standard and that you had a wonderful holiday. We arrived after midnight to find food and drinks to keep us going along with a very clean and well furnished villa. The beds were very comfortable and the showers provided a plentiful supply of hot water. A separate water cooler is a great idea,. though there is absolutely nothing wrong with drinking the tap water but of course it's not cold. It is certainly a very fine villa bordering on luxury. The sun beds are great quality with comfortable cushioning. There is plenty of helpful information and the TV system was most welcome to the teen boy. The beach club so near is a real plus where the sun loungers are free the water is cool and you can just dive straight in off the pontoon. There are so many restaurants in Kalkan providing excellent food that it is almost impossible to go wrong. It is worth a trip up to Adam's Place where you can watch the sunset over the sea, a great view. we had 2 excellent relaxing weeks in Sunny Kislar. Kalkan est une ville sophistiquée avec une multitude d’excellents restaurants situés sur le port et sur les toits et proposant des mets de qualité ainsi qu’un bon choix de bars à l’ambiance blues ou jazz. Les commerces du village restent ouvert jusqu’à environ minuit et sont bien achalandés : antiquités intéressantes, objets artisanaux, bijoux, tapis, vêtements et sacs en cuir. Les ruelles de la vieille ville sont idéales pour une balade en soirée. Il y a 2 banques avec distributeur de billets ainsi qu’un bureau de poste qui propose généralement le meilleur taux de change. Booking Notes: Change over day is generally Saturdays, but is negotiable. A Booking Deposit is required and is 25% of rental costs. The balance is paid 8 weeks before the holiday is taken. A returnable breakages deposit of £250 is held. Payment can be made into UK or Turkish Bank. Paypal will be added shortly. Please contact the owners to discuss any personal requirements and needs. Changeover Day: Preferred changeover is Saturdays, but is flexible. Departure time is usually noon, but again is flexible and depends on the arrival time of the next guests. Notes on prices: For the low season months of April, May and October, discounts are available for less occupancy (1-4 people). In this case two bedrooms will be made available. In the winter, off season months, the pool is empty and is not serviced. It can be filled and serviced at an extra charge. Payment by PayPal is accepted: Please contact owner.